Travis was born and raised in Fredericton, New Brunswick, Canada. Both of his parents were teachers, his mother is a Boston-native, which gives Travis both American and Canadian citizenships. After high school, Travis was recruited to play Division 1 Lacrosse for State University of New York at Stony Brook. From there, Travis earned his Bachelor of Science in Biology degree for West Virginia University. Next, he attended Marquette University School of Dentistry, earning his Doctorate in Dental Surgery (DDS) degree. He then moved to Manhattan for a 1-year General Practice Residency at Mount Sinai School of Medicine. Travis and his wife Lee (who was also raised in Fredericton) returned to Canada where he practiced general dentistry for 3 years. 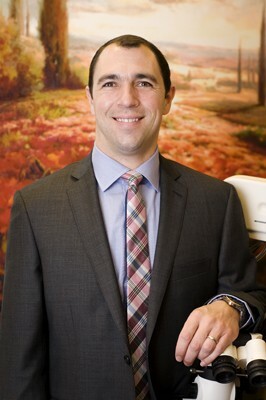 Next, Travis returned to Marquette University School of Dentistry to concurrently earn his Master's in Science (MS) degree and his Certificate in Endodontics. Throughout his academic journey, Travis has held several student body elected offices and was awarded numerous academic excellence awards. Travis and his wife Lee have been married for 13 years and have 3 young sons and a daughter, who they are raising in Lake Mary, Florida.